Runners starting the Sept. 22 Austin P.O.W.E.R 5k. The annual Austin P.O.W.E.R. 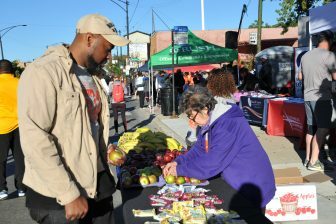 (People Organizing Wealth and Economic Resources) 5k Walk/Run continued to grow in size this year but didn’t garner the sponsorships organizers had hoped. 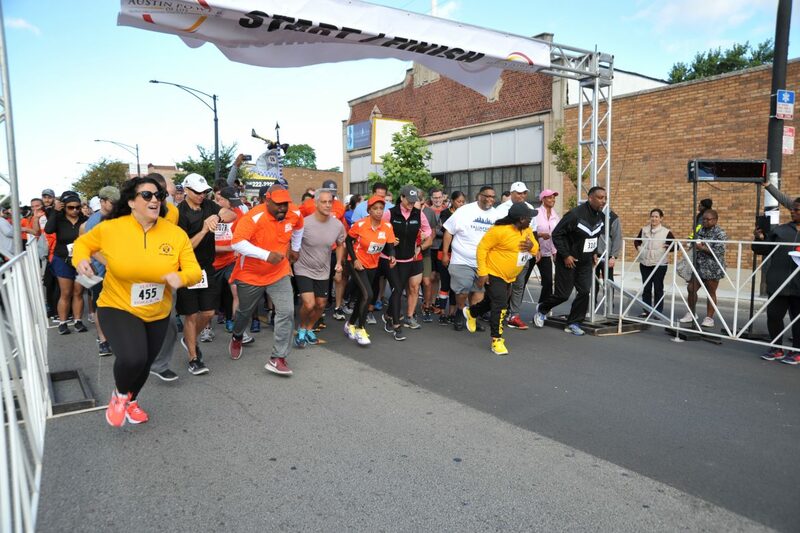 Last year, the race raised enough money to to buy $5,000 in new uniforms for the Chicago Police Explorers program, which offers youth the opportunity to experience daily activities of an officer. Raising money was more challenging this year, said Malcolm Crawford, race organizer and AAABNA executive director. It’s not clear whether this year’s race, held Sept. 22, will generate enough profit to provide a donation. Malcolm Crawford, executive director of the Austin African American Business Networking Association, speaking at the 5k. 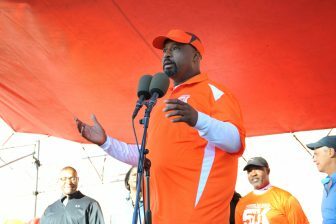 Regardless of the funds raised, Crawford said the race offered community members the opportunity to come together and promote wellness in Austin. The race saw a turnout of about 600 to 650 participants and spectators, similar to last year’s 600. It also received support from political leaders, including Mayor Rahm Emanuel, Chicago Clerk Anna Valencia, Ald. Chris Taliaferro (29th), state Rep. Camille Lilly and state Rep. La Shawn Ford. The 15th District CAPS Office and district officers played a major role in setting up and running the event. The Cook County Sheriff’s Department set up a “cheer station” along the race course and handed out refreshments to runners. 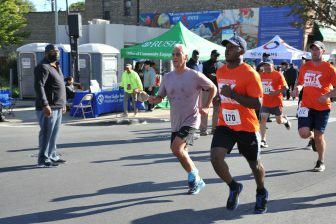 Mayor Rahm Emanuel (center) finishing the last stretch of the race. Tim Hoekstra, lead pastor at the Suburban Life Community Church and 5k planning team member, said it’s always surprising to see the amount of support in the community for the race. “I have both participated in and have run a lot of races, and this one is unique because it is the police, it’s community organizations, it’s the residents, it’s businesses and it’s churches, all working together on one effort for this neighborhood,” Hoekstra said. Additional assistance also came from partners, including Austin Coming Together, New Moms, Austin Weekly News, the Westside Health Authority, the Greater Austin Development Association and MacArthur’s Restaurant. Jenna Hammond, director of development and communications for New Moms, said the race creates a fun and safe way to invite people to the neighborhood and learn about various programs. “It makes the race this great community event where we get to go out, be in our neighborhood, walk the streets, say hello to neighbors and get to know each other. But then there are also these great resources where people can come and ask questions, and learn about things in their community,” Hammond said. This year, New Moms registered 46 runners for the race and also set up a “cheer station” along the course. The organization has assisted with the race since its conception in 2015, and Hammond said they will continue to do so. Booths set up by community partners. New Moms is even discussing ways its programming can be built around the 5k, possibly by using the race as a wellness event or a goal clients can set for themselves, Hammond said. Because of the growing number of volunteers assisting in the race each year, Crawford said they will be better able to plan for next year’s race. One goal to register people for the race earlier in the year by attending community walks or events, and by reaching out to local businesses and organizations. Malcolm Crawford and Charmaine Rickette will be recognized as Greater St. John Bible celebrates its pastor's 50th birthday.